The opportunity to surround yourself with top content thought leaders and practitioners is one that you should always take. That’s just what we will be doing February 15 -17 at the 2016 B2B Content2Conversion conference in Scottsdale Arizona. We’ll be packing our bags and leaving the cold Minnesota climate for warmer weather and three days filled with top-notch B2B content marketing education. But before we dig into that, lets review the current state of content marketing for B2B marketers and why conferences like this are so essential. A recent Content Marketing Institute study revealed that a full 88% of B2B marketers have adopted some form of content marketing. Go a layer deeper in this same study and you’ll discover that 55% of these same folks are unsure what B2B content marketing effectiveness really looks like. Is it time to pump the brakes on content marketing? Or, are half of B2B marketers simply missing the mark? At TopRank Marketing, we’ve had the pleasure of partnering with amazing brands and thought leaders on numerous B2B content marketing initiatives. And the picture of success is slightly different for each program. But despite these differences, there’s one common thread among effective B2B content marketing initiatives: we know exactly what success looks like before we publish a single piece of content. There are countless resources and tools available online for B2B marketers looking to ignite their content marketing skills. But in truth, the best way to learn is from peers. 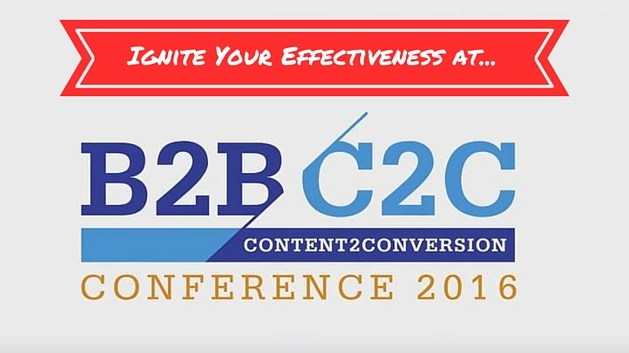 Below is a preview of some of the sessions I’m most excited about attending at this years B2B Content2Conversion conference. As search engine algorithms continue to evolve, so too should the nature of our SEO skill-set. According to LinkedIn data, SEO is one of the most in-demand skills for 2016. With today’s increasingly self-directed business buyers, content that is easily found through search is even more crucial and important for marketers. This presentation will cover how smart B2B marketers are integrating SEO with content. Other topics include the importance of mobile and other recent changes with Google that B2B content marketers need to be aware of. Lastly, this presentation will cover content SEO best practices. There are new rules for growing business, spreading ideas and generating attention in our always-on, Web-driven world. Advanced planning is out – speed and agility are in! Scale and media buying power are no longer a decisive advantage. Instead, real-time is the mindset for the future where content is king! In this session, Author David Meerman Scott will discuss how content, the web and customers have completely turned B2B marketing on it’s head. Laura Ramos writes research for B2B Chief Marketing Officers. She helps Forrester’s clients plan, build, and deliver marketing programs that combine traditional, digital, and social approaches that lead with business issues and fuel their company’s topline growth. In Laura’s session, you’ll learn how applying advocacy to your content marketing programs can garner authenticity and deeper impact. Heidi has over 10 years of B2B marketing experience in high tech companies. Her expertise includes product positioning, brand strategy, product marketing, and demand generation. In this session, she will discuss the all-important aspect of timing in content marketing. All too often, marketers push content to customers who may not be interested in the brand or message. Heidi will discuss how content marketers can utilize the plethora of data available to make smarter decisions about their message, buyer and content timing. If you’re attending the conference, feel free to reach out or flag me down in person. I’d love to chat about how you can ignite your content marketing! Otherwise, be sure to follow our liveblogging here on TopRank’s Online Marketing Blog. Catch us on Twitter too at: @TopRank, @leeodden and @knutesands.